The bridging vein or veins normally refer to veins which traverse the prepontine cistern to connect veins which run on the anterior aspect of the brainstem to the cavernous sinus or the clival venous plexus. They are easily identified on both contrast MRI and catheter angiography. However, they can be found in other places, such as the cerebellopontine angle cistern (see below). In fact, the Petrosal vein (P) is simply a large and nearly constantly present bridging vein between the anterior brainstem group of veins and the superior petrosal sinus. This is an important concept which could use repeating — the bridging veins and the petrosal vein are homologous and complementary. Embryologically, the petrosal vein evolves from what constitutes the primary brainstem venous drainage at about 10-60 mm embryo size (ventral mesencephalic vein), and thus usually is the primary bridging vein in the adult. 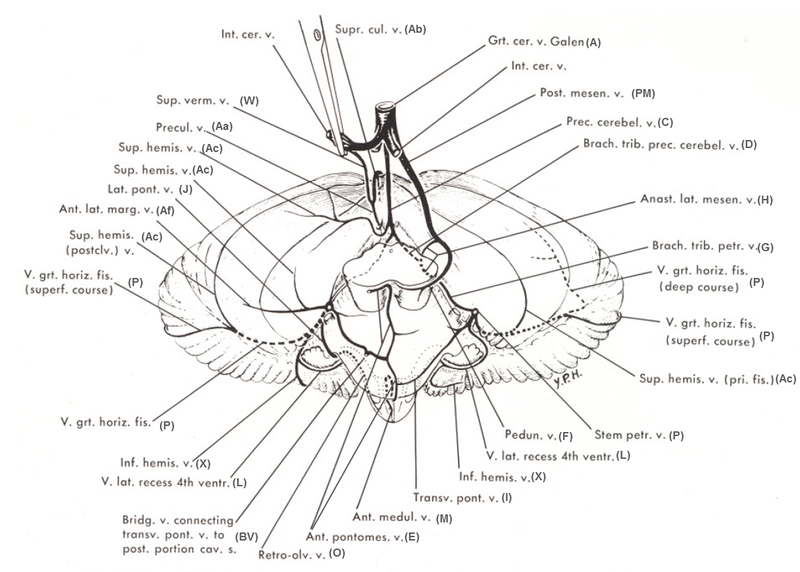 A diagram from Yung Peng Huang and Bernard Wolf, Veins of the Posterior Fossa. Chapter 75, in Newton and Potts Radiology of the Skull and Brain. Volume 2, book 3. 1974, showing a bridging vein (BV) from the transverse pontine (I) vein. 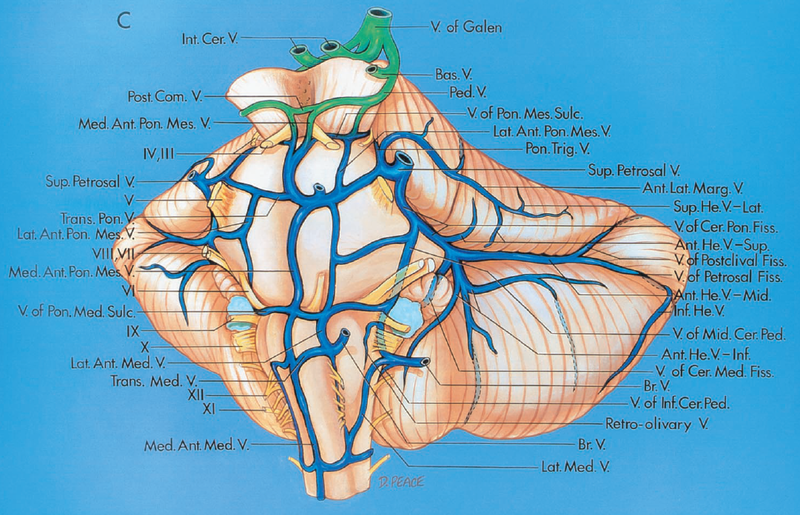 Below is a diagram from: Albert Rhoton, The Posterior Fossa Veins. Neurosurgery 2000 Sept 47(3), S69-92, showing a bridging vein at the level of the medulla. An unlabeled bridging vein is also associated with the transverse pontine vein. The anterior group of brainstem veins, as evident from the name, is composed of various veins named “anterior mesencephalic”, “anterior pontomesencephalic”, “anterior pontomedullary”, etc. It is simply a channel that, potentially in its full expression, extends from the peduncular vein, in front of the brainstem, to the anterior spinal vein with which it is homologous. All or parts of it can be absent or developed to some degree. When the anterior group is dominant, the lateral or anterolateral longitudinal veins such as the lateral mesencephalic vein, a.k.a. the anastomotic lateral mesencephalic vein (an important vein which connects the basal vein to the petrosal vein) may be hypoplastic. This is exactly like the supratentorial situation with either Labbe or Trolard or Sylvian dominance idea. The longitudinal veins are connected by transverse group of veins, which are named however you feel like it — vein of the pontomesencephalic sulcus, transverse pontine vein, pontomedullary sulcus vein, etc. It is easier to name them than to actually figure out whether or not they are in the assumed sulcus on the angiogram. It is certainly easier on MRI. The point is that there is a grid-like connection. Now, to finally come to the point, the anterior group of veins can drain in various ways. Sometimes it drains into the spinal vein, and from there often radicular veins which empty into the epidural venous plexus can be seen, which is very cool. However, this is usually not the case. More commonly the anterior group will drain into the petrosal vein via the transverse group of veins or, finally, via the bridging veins into the back of the cavernous sinus or the clival plexus. In the images below, the larger left (light blue) and smaller right (dark blue) bridging veins drain in the back of the cavernous sinus (pink). This can be easily seen on MRI when the vein traverses the prepontine cistern. 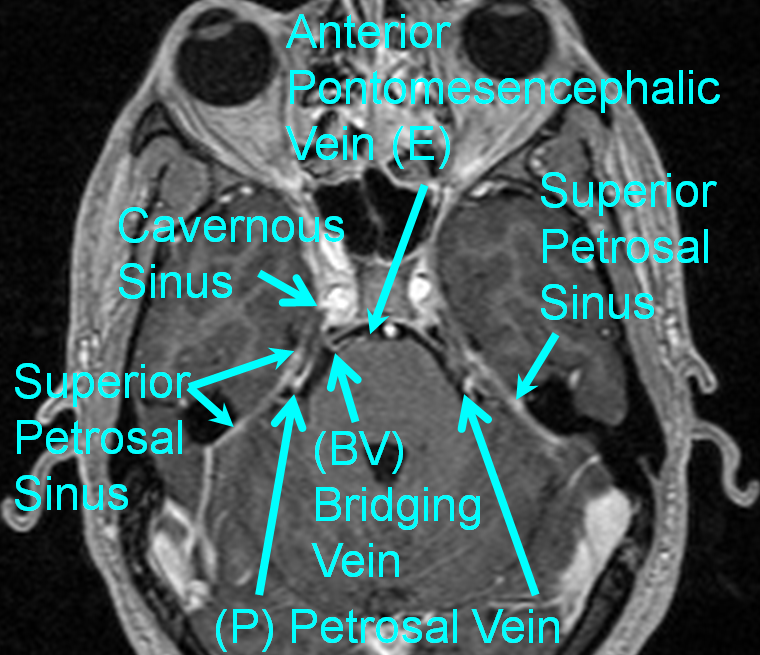 Notice also the well-seen transverse pontine veins (yellow), the pontomesencephaic sulcus vein (brown) draining into the paired anterolateral pontomesencephalic veins (black) located, each of which drains into its own bridging vein (blue arrows). 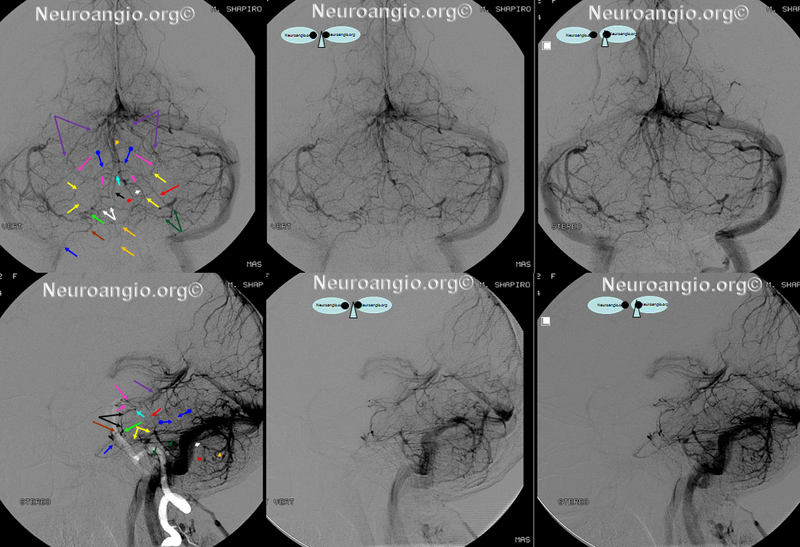 The anterolateral pontomesencephalic veins are connected to the interpeduncular vein (red). Notice that the bridging veins are usually located off midline. This rather confusing at first sight picture really comes alive in stereo. 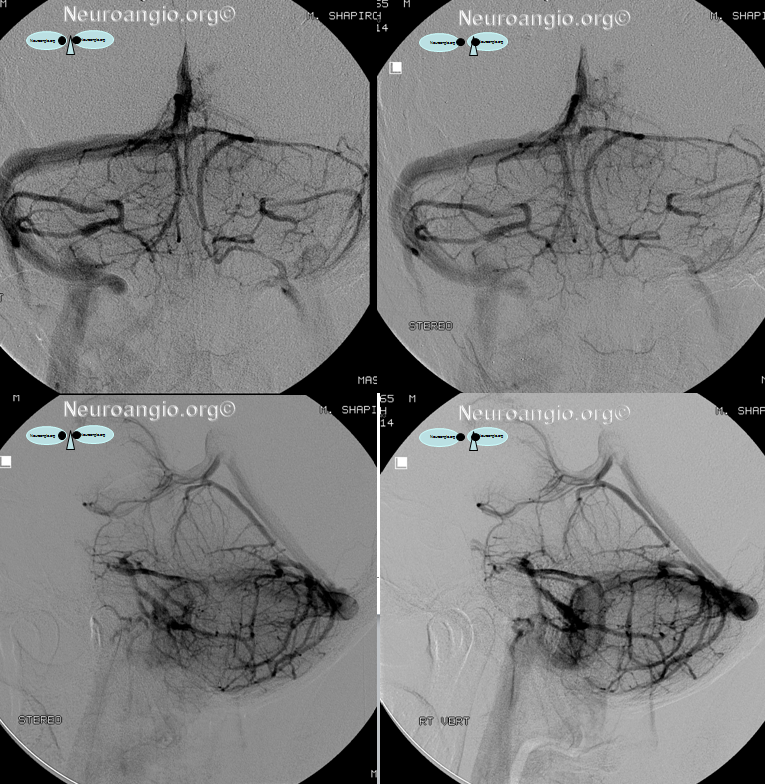 Like everything else, the bridging veins are in balance with other potential drainage avenues for the anterior group of brainstem veins — the petrosal vein and the posterior mesencephalic vein which typically drains into the Galen. 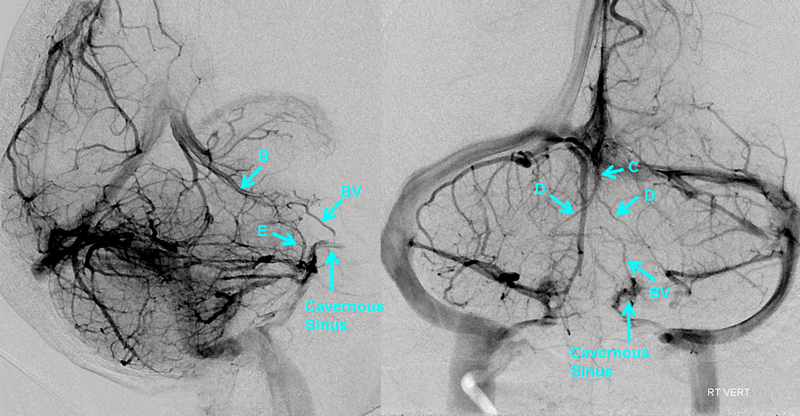 Here is a particularly large bridging vein connecting the anterior pontomesencephalic vein to the back of the cavernous sinus. Also notice well-developed precentral (C) vein and its brachial veins (D) — veins of the superior cerebellar peduncule according to Rhoton’s classification.